Aiseesoft 3D Converter for Mac can help you easily convert 2D movies to 3D format, and it supports converting 3D video to standard 2D video formats on Mac. Plus, it can convert 3D video to other types of 3D video with outstanding output quality. This 3D Video Converter for Mac supports several 3D modes - Anaglyph 3D, Side by Side 3D, and Top and Bottom 3D. You can select any one according to your need. Now it supports HTC One X, HTC Butterfly, Samsung Galaxy S4, Samsung Galaxy Tab 2, Nokia Lumia 920, BlackBerry Z10, Google Nexus 7, Motorola Droid Razr M, Kindle Fire HD and Asus Transfor. 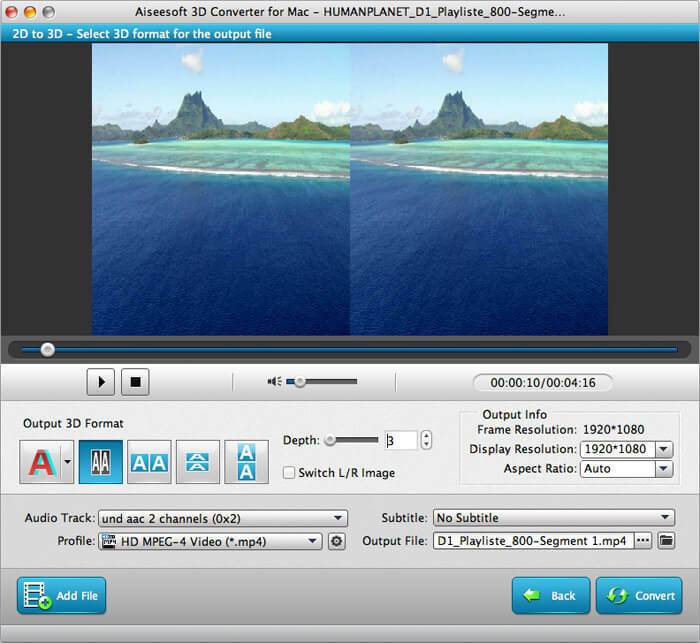 Aiseesoft 3D Converter for Mac can convert your 2D movies to any 3D formats, including Anaglyph (ten types), Side by Side (Half-Width/Full), Top and Bottom (Half-Height/Full) on Mac and play 3D video files on Mac, standard TV/3D TV, even glasses-free 3D smartphones like HTC EVO 3D, Sharp SH-12C Aquos 3D, and LG Optimus 3D P920, and other compatible 3D display devices. Also you can convert 3D video to standard 2D video formats on Mac. With the help of Aiseesoft 3D Converter for Mac, you can convert Side by Side (Half-Width/Full), Top and Bottom (Half-Height/Full) 3D video to other types of 3D videos like Anaglyph, Side By Side (Half-Width) 3D, Side By Side (Full) 3D, Top and Bottom (Half-Height) 3D, or Top and Bottom (Full). Easily and fast. Aiseesoft 3D Converter for Mac supports ten types of Anaglyph 3D (Red/cyan anaglyph, monochrome; Red/cyan anaglyph, half color; Red/cyan anaglyph, full color; Red/cyan anaglyph, high quality Dubois; Green/magenta anaglyph, monochrome; Green/magenta anaglyph, half color; Green/magenta anaglyph, full color; Amber/blue anaglyph, monochrome; Amber/blue anaglyph, half color; Amber/blue anaglyph, full color), Side by Side (Half-Width) 3D, Side by Side (Full) 3D, Top and Bottom (Half-Height) 3D and Top and Bottom (Full) 3D. Xilisoft WMV 3GP Converter links 3GP mobile phones to Windows media players with the functions of WMV to 3GP converter and 3GP to WMV converter, which can convert WMV/ASF to 3GP/3G2, convert 3GP/3G2 to WMV, and extract WMA audio from 3GP/WMV video.